Khmer temples further north of Siem Reap: Beng Mealea, Phnom Kulen, Kbal Spean, Koh Ker and Bantey Chmar, with optional overnight in nearby villages, for a memorable experience. From Siem Reap: 60 km (36 miles) – a 1h30 drive. Hindu temple dedicated to Vishnu, built in sandstone during the reign of Surya-varman II, the builder of Angkor Wat, in the early 12th century. Beng Mealea, left unrestored, has only been recently opened to visitors. 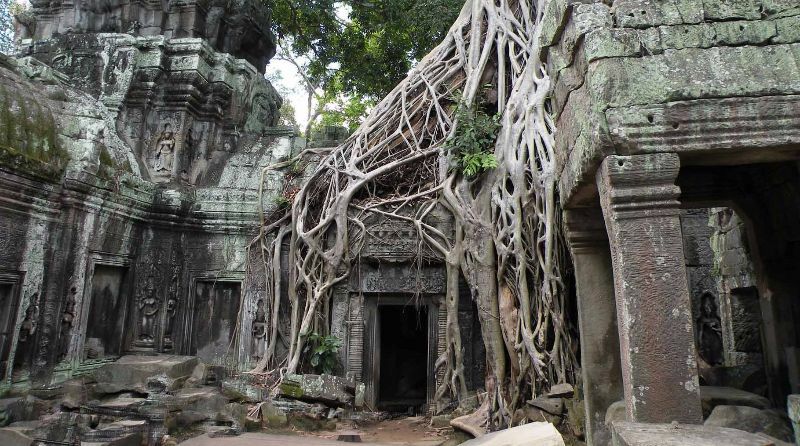 The site, hidden in the jungle with ruins covered with tree roots, is most appealing. Touring the temple was made easier after the shooting on the site, in 2003, of Jean-Jacques Annaud’s film “Two brothers”, for which a long walkway running along the center of the ruins was built and kept thereafter. The most sacred place for the Cambodians, who go on pilgrimage year round and particularly during the Khmer New Year (mid-April). Kulen is considered as the birthplace of the Khmer Empire, where King Jaya-varman II proclaimed the independence of his kingdom from the Java Empire and declared himself the god-king of the Khmers in a ritual ceremony on the peak of the mountain in 802. There is a series of tiered waterfalls where today’s people enjoy bathing as in times immemorial. The Wat Preah Ang Thom sanctuary at the summit of the mountain houses a giant 17-m long reclining Buddha and offers spectacular views across the surrounding forests. From Siem Reap: 50 km (30 miles) – a 1 hour drive. From Phnom Kulen: 30 km (19 miles) – a 30 minutes drive. Discovered in 1968 only, Kbal Spean, on the southwest slopes of Mount Kulen, features carvings of numerous lingas (god Shiva’s phallic symbol) on the Stung Kbal Spean riverbed, believed to fertilize the water. Stone carvings of the Hindu gods Vishnu and Brahma dot the riverbanks. From Siem Reap: 140 km (84 miles) – a 2.5 to 3 hours drive. From Kbal Spean: 90 km (54 miles) – a 2 hours drive. Koh Ker was the capital of the Khmer Empire for a short time in the 10th century, during the reign of King Jaya-varman IV. The main temple, Prasat Thom, is a huge seven-level pyramid in sandstone, ascended through a steep flight of stairs, with spectacular views over the surrounding jungle. 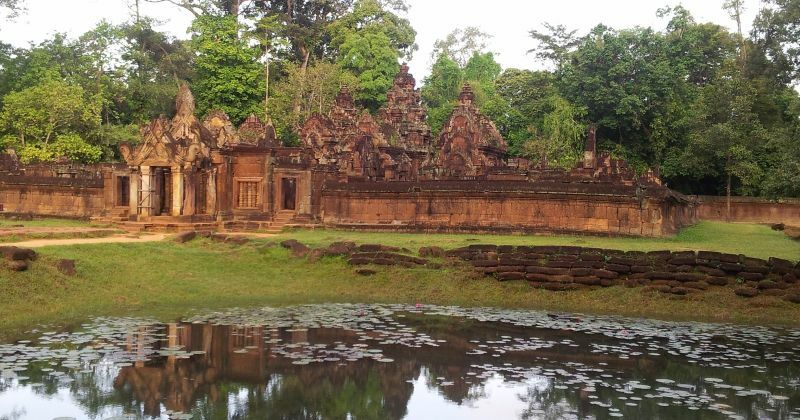 You can round off the tour with the visit of the beautiful Hindu temple of Banteay Srei on the way back to Siem Reap, as well as the peaceful Sra Srang reservoir and Aki Ra’s landmine museum. Preah Vihear is an impressive Hindu temple representing Mount Meru and dedicated to Shiva, perched on the top of a spectacular cliff. 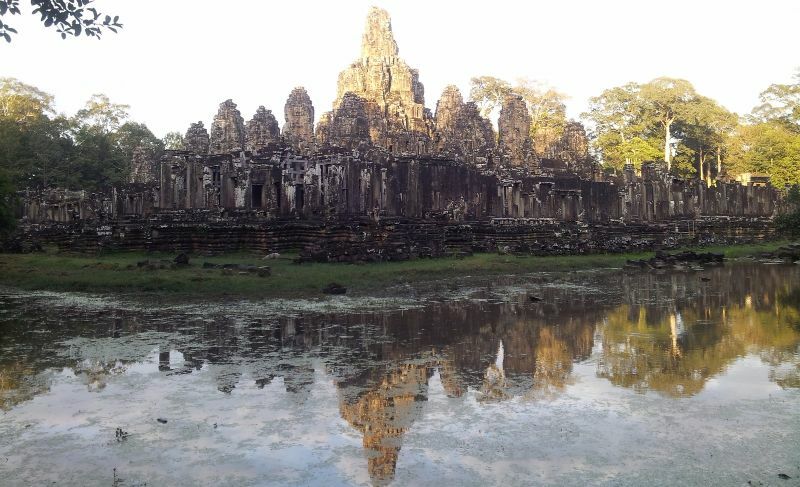 Set in a secluded location, the temple is similar in style to Bayon Temple, also commissioned by King Jayavarman VII. It is one of only two sites outside Bayon with the enigmatic face towers. There are magnificent bas-reliefs on the outer gallery depicting military battles and daily life scenes very similar to those in Bayon. Visitors need to be careful as there are many collapsed rocks and ruins all around the temple.